POITOU, FRANCE – Autumn has come. And come hard. It is rainy and chilly. No more coffee in the morning sun. No more dinners on warm evenings out on the porch. For the next three months, there will be more night than day… more darkness than light… more failure, we predict, than success. Yesterday, we let out the two kittens we took with us from our recent stay on Île d’Yeu. This morning, only one showed up for breakfast. I don’t have an MBA. I don’t have an Ivy League degree. Heck, I didn’t do all that great in college either. I’m just an ordinary guy from Kansas, born on a farm. Yet, in the 1980s, I stumbled onto a secret that has transformed my life. (And still does to this day!) It’s a financial secret that allowed me to retire at the age of 42 and still make more money in 1 day than most people make in a month of work. (400% gains in 18 hours… 188% in 24 hours… 200% in 8 days… 117% in 24 hours…186% in 24 hours…) The next few days will be the single best time to use my secret all year. It has to do with a highly predictable act of Government meddling that creates even larger—and faster—moneymaking opportunities than usual. Real prosperity requires real work and real resources, not phony tricks and fake money. We still earn our bread from “the sweat of thy face.” The rest is detail. As you know, the 21st century has been a big, fat flop. After rising by about 2% a year in the three decades up to the mid-1980s, real incomes stopped growing at all. After you factor for inflation, the average American earns scarcely a penny more than he did in 1999. And many men – especially in “flyover country” – earn much less. Look to thy face: There are only so many hours and only so many resources available. Waste them, and you’ll grow poorer. Government regulation… welfare… Medicaid… military spending… war… time spent on Twitter and Facebook… opioid use – all are up dramatically. Meanwhile, saving… capital investment… hours worked… new businesses started – all have fallen sharply. The personal savings rate is only half what it was in the 1960s, 1970s, and 1980s. Net investment in capital – money spent on expanding businesses and growing productivity – is one-third lower than its average over the past century. Instead of putting more capital into the capitalist system, Wall Street suits used the Fed’s cheap money to take it out. Since the beginning of the century, about $4 trillion worth of shares has been removed from the stock market. Companies borrowed to buy back shares and cancel them or to finance leveraged buyouts (LBOs), mergers, special dividends, and so forth. Corporate insiders and shareholders got bonuses, fees, capital gains, and dividends. The company – see Toys “R” Us – was left holding the bag, with its capital impaired by debt. 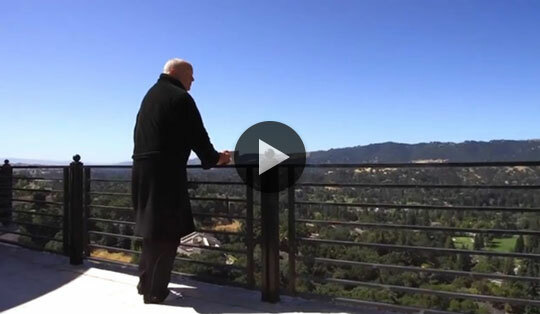 It’s corrupt, violent, and bleak… like the backdrop of a James Bond movie. Yet places like this have generated some of the most profitable moneymaking opportunities in the world—like 1,000%… 5,000%… or more. Details here. In 1950, 9 out of 10 working-age American men had jobs. Today, only 7 out of 10 do. By our estimate, that’s about 15 million adult men who are diddling around on the internet rather than adding to wealth. The composition of the workforce changed, too. Breadwinner jobs declined; part-time jobs in the low-paid service sector – waiters, bartenders, auto washers, etc. – increased. Even in the thriving tech sector, so far this century, the number of full-time jobs has fallen 25%. Meanwhile, the nation added 4 million barkeeps and other part-timers. With so much money and time taken out of the capitalist economy, is it really any wonder that real economic growth has been so punky? GDP figures show growth of about half the rate of the 1960s, 1970s, and 1980s. But those figures are distorted by the feds. Look instead at unadulterated sales figures. There, you see the real story: Since the beginning of the 21st century, growth in real sales has been running at about only one-third the rate of the previous century. That is the big picture, as we see it. The feds – with their fake money, phony interest rates, wanton borrowing, imbecile boondoggles, and dumb meddling – have hobbled the economy. It can’t soar. It can’t fly. It can barely even walk! Six stocks… this fall… and a huge turnaround for the Trump presidency. If politics is to blame for this morass, we need to take a closer look. Perhaps a reformer could make a change? Wealth is created by voluntary win-win transactions. But the government is armed. It insists on involuntary, win-lose deals. All governments, no matter what you call them, are dominated by insiders. The few exploit the many, finding ways to make win-lose deals work for them at the expense of everyone else. Over time, the power and wealth of the insiders (aka the Deep State) grow relative to the rest of the society. Because the power and wealth of the Deep State depend on these win-lose deals, and because the government is controlled by these insiders, reform is very difficult. People grumble. But few understand what is going on. Instead, they are easily distracted by debates over monuments… kneeling athletes… red vs. blue… celebrity newscasters… and so on. And that’s why Mr. Donald J. Trump is the president. For this system to continue, someone needs to divert the masses with petty squabbles… while the insiders pick their pockets. The S&P 500 crossed the 2,500-point milestone for the first time in history the Friday before last. And the Dow has also been setting new all-time highs. But in global terms, the U.S. stock market has been a laggard in 2017. 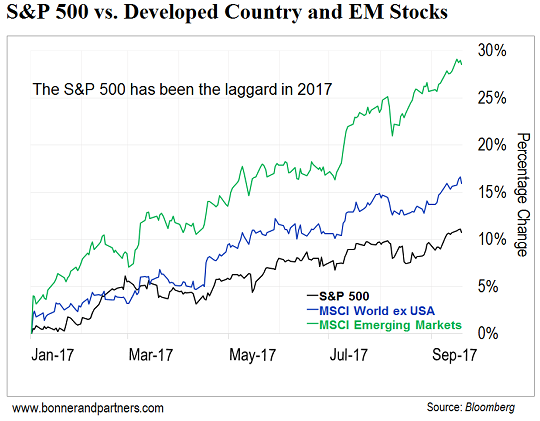 Today’s chart tracks the year-to-date performance of the S&P 500 versus stocks in developed countries outside the U.S. (MSCI World ex USA Index) and emerging-market stocks (MSCI Emerging Markets Index). So far this year, the S&P 500 has returned 11%. But it has been bested by stocks in developed countries outside the U.S. – a 16% return this year. And it’s been left in the dust by emerging-market stocks, which are up 29% so far in 2017. As Bill mentioned above, residents in “flyover America” are missing out on new economic opportunity. This infographic shows just how bad the situation has become. Is Jamie Dimon Scared of Bitcoin? Earlier this month, JPMorgan CEO Jamie Dimon called bitcoin a “fraud” and said it was destined to fail. Is Dimon convinced that cryptocurrencies like bitcoin are a fad? Or could he fear what they mean for his business? America is now more than $20 trillion in debt with no plausible way to pay it back. But there is a “Hail Mary” option. Wall Street veteran and former CIA adviser Jim Rickards shows the one desperate move the feds might make to solve America’s debt. There is more to the Bonner Doctrine than fake money; there is also the Deep State orchestrating the whole scam. Look, it’s possible, perhaps even likely, that you’re right about Mr. Nixon’s ill-fated closing of the gold “window,” the gamble of no consequences in taking the fake-money leap of faith, the Deep State and the Swamp, and all the rest of it. Perhaps the Diary is the fevered musings of a humane intellectual, desperate to make sense of the wheels coming off what was once the grandest machine in the business. And I have been musing right along with you for most of my 65 years. But lately, I am beginning to come around to the idea that the current state of affairs could be the result of rank incompetence and stultifying stupidity on the part of the masses, and the willful inattention of those who should know, and choose, better. Still, the destination is the same, and so, carry on, sir. Many thanks and best always. I was wondering when you were going to say the market could potentially go higher than anyone would dream possible. As long as the fake money keeps flowing, all things are possible. The devastating scenario you have told us about could very well happen. Yet again the fake-money digital printers could keep things relatively stable for 100 years. Last year I talked my wife into moving her retirement out of the market until the “inevitable crash,” and then get back in. When the market passed 19,000, I said, “I think you better get back in.” She is up 90,000 since January. I figure we lost between 30 and 50 when she was sitting out. I will no longer advise her on what I think the market will do. I am glad I told her to get back in, obviously. I learned my lesson. I’m through. I silently live with the fear.